Water pricing can be one of the most effective methods to driving conservation and it is also the primary mechanism for recovering the revenue that a water utility needs to protect public health and the environment. The Environmental Finance Center at the University of North Carolina and the Sierra Club, Lone Star Chapter have written a report to help Texas water utilities use their water rates and financial policies to encourage customers to reduce their water use while maintaining the financial viability of the utility. 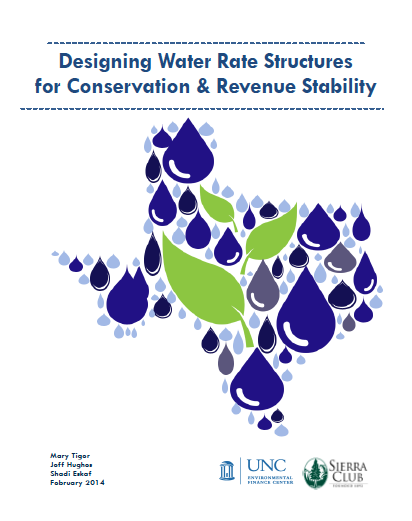 Webinar Information: UNC and the Sierra Club hosted a webinar on March 19 that focused on the findings and recommendations of our new report that explores the relationship between water pricing, water use, and revenue stability in the State of Texas. The webinar addresses how utilities can strike a balance between conservation and revenue stability and introduce rate structures, billing options, and financial practices that will help utilities advance water conservation objectives without undercutting needed revenue stability.